White envelopes for quality communication. Strong glue to keep secure when in transit. Clean surface is perfect for writing and printing on. Self-seal for convenience when sending many items at once. Size: C4. 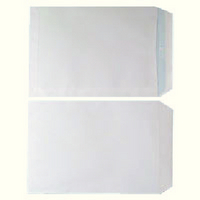 Pack of 250 envelopes. Grammage: 90gsm. Approx Dimensions (CM): D14.5 W24 H37. Approx Weight (KG):3.92.